A warm and windy Saturday morning finds me 20 feet up listening to my buddy Tim (bow and gun hunter) seduce the bucks with a symphony of grunts, bleats, and rattles. His acoustic masterpiece entices a mighty fine looking buck that unfortunately walks directly downwind from me at 50 yards and gets a rather robust nose full of my "backend" (Pizza and Beer the night before are a dangerous combo). The buck sneaks into a patch of willows that is thicker than Tom Selleck's chest hair, presumably never to be seen again. Two hours pass before we decide a "push" is in order, so I head to the river bank to circle a quarter mile downstream. I finally ease back into the woods and kneel in a good spot that has a trail to the left at 4 yards, and opening in front at 10 - 25 yards, and a trail to the right at 15 yards. Ten minutes later a doe is trotting straight at me from 25 yards, seconds away from meeting her certain demise at 4 yards. Then she flops down pancake flat and stares back. She is only 15 yards from me, but all I can see are her ears. Damn, now I can't move a muscle. Two minutes later, the buck steps out directly in front of me at 22 yards, but he is quartered to me. For a full minute he hasn't moved and he is completely unaware of me. Then, the sun bursts out of the clouds and shines directly on me - NO! He immediately starts giving me the head-bob and foot-stomp routine. Not impresed with my imitation of a statue, he tucks his tail and slinks back into the trees. I check on the doe, hell, there are 2 does now and they are standing about 15 yards away behind some trees and they are still looking away. Four more minutes of not moving, legs completely asleep now. Then all hell breaks loose. The buck reappears suddenly and joins the does on my front left, all behind trees. They all presumably decide on a plan, "does go East, buck go West, ready break"! Here he comes trotting from my left to my right. He is going for the trail on my right at 15 yards. I swing my bow, draw and release as he hits the last possible opening. OH NO, I shot him in the guts. The fletching is sticking out his belly as he kicks it into high gear. My partner shows up 7 minutes later and I give him the story. We decide to give him 30 minutes, go back to the truck and get the canoe. However, before we leave the spot, we decide to walk over to where I hit him to find the blood trail. Damn, no blood. I walk 8 yards forward, and catch movement out of the corner of my eye. "Tim, here he comes, you gotta shoot him with the 30-06!". 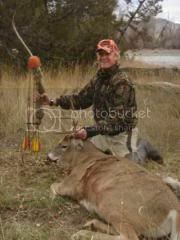 Tim brings the rifle up, but the buck dissappears behind a small group of trees on the river bank. Where did he go? He was only 40-50 yards and not looking healthy, and we can see left and right. The only thing we can't see is the river behind the trees. A quick strategic conference, and we decide to sneak very slowly towards his location. Ten steps into the sneak, I swear I hear a splash. Oh no, he must be trying to swim the river. We shift into 2nd gear moving to the riverbank. I still can't see a damn thing when I hear Tim make some sort of caveman alarm grunt, followed immediately by a rifle blast. I charge to the river bank and see.....NOTHING..........no deer in the water, no deer on the opposite bank! Then I look 7 feet in front of us and my buck is anchored into a tangle of brush at our feet, Tim having effectively put 180 grains through both front shoulders without even using the scope. We pull his ENORMOUS body from the bush he had bedded in and see the arrow sticking perfectly out of his chest, right behind the shoulder! What, I thought I gut shot him? The autopsy revealed a quartering away angle and the arrow actually going through the stomach, diaphragm, and the back of the far side lung. He would have been dead in minutes. The rest of our time was spent taking photos, dressing him out, dragging to the river bank, etc. Oh, there was a small incident with the canoe blowing out into the river and setting sail for North Dakota. I really should find that fisherman and buy him a beer for beaching his raft and saving the canoe. Enjoy the pics. 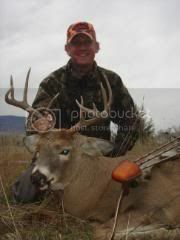 Kooter - heck of a deer and heck of a story!! Good job! !